With brothers Coke and Pete Escovedo growing up Oakland in the sixties, surrounded by Latin music, it’s no surprise that they decided to form their own group, Azteca. Like Santana, Azteca were a pioneering and innovative group. Their music was a fusion of a multiplicity of musical genres and influences, including Latin and funk. Best known for their vocal and percussive talents, Azteca blazed a trail for Latin music, bringing the delights of Salsa and Mamba to a much wider, appreciative audience. In many ways, Azteca were more than a band, they were musical pioneers and innovators. So Azteca were much more than a band. Indeed, referring to Azteca as a band in an understatement. A much more fitting description is that Azteca were a pioneering Latin orchestra, featuring up to twenty-five musicians. These weren’t just any musicians. Not at all. Azteca were an all-star band. Among their number were bassist Paul Clark who played on several Herbie Hancock albums, while drummer Lenny White worked with everyone from Miles Davis through to Stanley Clarke and Freddie Hubbard. With such a multitalented lineup, and having honed their skills over several years, Azteca were signed to Columbia Records. 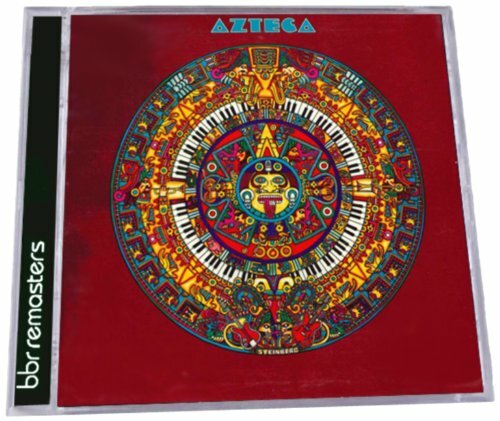 In 1972, Azteca released their debut album Azteca, which will be rereleased by BBR Records on 28th January 2013. Before I tell you about the music on Azteca, I’ll you about Azteca and their trali-blazing musical journey. During the last few years of the sixties, music was evolving quickly. Quickly, musical fashions were changing and melting into one. Musical genres and influences collided, merging and melting into one. Often, artists fused a variety of genres and influences to create their own signature sound. Jimi Hendrix merged blues, rock, jazz, psychedelia, funk and Latin music. Santana did something similar. Their music is a melting pot of rock, blues, psychedelia, jazz, funk, Salsa, Mambo and Latin music. Seamlessly, it melts into something new and innovative. Two musicians that played their part in Santana’s unique and pioneering sound were brothers Coke and Pete Escovedo. Having been part of Santana’s rise to success, Coke and Pete decided to form their own band, Azteca. For Coke and Pete forming Azteca made perfect sense. They’d grown up in Portland not just surrounded by Latin music, but totally immersed in the music. It was something they loved, lived and breathed. So keen to perfect their percussive skills, Coke and Pete decided to organize Mambo lessons. During these lessons, they were able to benefit from the experience of other musicians’ experience. The effect this had was to hone and perfect Coke and Pete’s percussive skills. However, it wasn’t just Latin music that influenced Azteca’s music. Just like Santana, their music is a melting pot of rock, blues, psychedelia, jazz, funk, Salsa, Mambo and Latin music. This melting of music brought Azteca to the attention of Columbia Records. Columbia Records signed Azteca and in September 1972, work began on recording their eponymous album Azteca. Recording took place at Columbia Studios in San Francisco. Joining Coke and Pete Escovedo were some of the most talented jazz and Latin musicians of the time. Over a dozen musicians played on the eleven tracks on Azteca. This included a horn section and a myriad of percussive delights. Many of the tracks on Azteca were penned by members of Azteca. Of the eleven tracks, Pete cowrote Peace Everybody and Ah! Ah! Once Azteca was recorded, it was released in December 1972. On the release of Azteca in December 1972, it reached number 151 in the US Billboard 200 and number thirty-eight in the US R&B Charts. Neither of the singles fared as well. Mamita Linda was released in 1972 and Ain’t Got No Special Woman in 1973, but neither charted. However, Azteca had proved a commercial success, introducing a wider audience to the unique and innovative sound of Azteca, which I’ll tell you about. Although La Piedra Del Sol which opens Azteca is just seventy-three seconds long, it’s a tantalising taste of what’s in store. Urgent, growling horns, meandering, noodling keyboards and dramatic, question strings merge with a myriad of percussion. A glimpse of crystalline guitars whets your appetite as jazz, Latin, classical and rock unite dramatically. Now Azteca have your attention, they won’t let go. Mamita Linda picks up where the opening track left off. Thunderous drums, stabs of braying horns, percussion and cascading flute combine as the track explodes into life. The lyrics are delivered in Spanish and English, and delivered with a fervor that matches the arrangement. Accompanying the vocal is a truly infectious arrangement, that gallops and thunders along, mixing Latin, jazz and Salsa. It’s a mass of percussion, drums and piano. Stabs of flute urgently answer the vocal. By the end of the track, you’re spent and exhausted, at the energy and enthusiasm Azteca have expended. Ain’t No Special Woman sees Azteca seek inspiration from Santana. It’s probably the poppiest track on Azteca. There’s more than a nod to Santana’s Black Magic Woman. Azteca have their tongue placed firmly in their cheek here. It’s as if they’re saying anything Santana can do, so can we. From the opening bars you’re hooked, as Latin, rock, jazz, psychedelia and funk are thrown into Azteca’s musical melting pot and stirred for six minutes. With punchy horns, Hammond organ, rhythm section and percussion the arrangement sashays along. Rico Reyes’ vocal is heartfelt, accompanied by soulful harmonies and later, delivered in a call and response style. Later, when Azteca kick loose, they flourish, showcasing their mesmerizing skills. Frantic percussion, searing, screaming rocky guitars, bursts of growling horns unite to fuse musical genres and influences aplenty. This results in the highlight of Azteca. Here, you can’t help compare Azteca to Santana, albeit with more than a hint of Jimi Hendrix thrown in for good measure. Empty Prophet sees the tempo drop, with a really moody, bluesy backdrop accompanying Errol Knowles’ despairing vocal. Space is left in the arrangement, proving effective, allowing the vocal to take centre-stage. A wandering bass, rasping horns and thoughtful rhythm section combining with chiming guitars and Hammond organ. Gradually, the arrangement grows in power and drama. So too does the vocal. It grows in emotion, power and doubt, questioning and probing, while breathing life and meaning into some of the best lyrics on Azteca. Can’t Take the Funk Out of Me sees Azteca combine good-time funk with elements of rock, jazz and Latin music. Add to that gospel tinged harmonies. It’s a delicious fusion. A tough, uber funky bass-line, stabs of blazing horns and sizzling, searing rocky guitar at the heart of the arrangement, while Paul Jackson’s grizzled, sassy vocal briefly reminds me of B.B. King. Gospel infused harmonies accompany Paul, as they drive each other to greater heights. Meanwhile, the band showboat. Their grandstanding is mesmerizing. The rhythm section and horns join keyboards and percussion to create what’s quite simply delicious slice of good time funky music. When Peace Everybody begins, you’re reminded of the unmistakable opening to Isaac Hayes’ Shaft. It’s the rhythm section complete with hissing hi-hats that lead to this comparison. Bursts of growling horns transform Azteca into a funk-laden musical juggernaut. Driving the arrangement along are the funkiest bass and searing guitar licks. They’re helped by the impassioned vocal, who are joined by joyous, pleading harmonies. Peace Everybody is their plea. Then later, Bob Ferreria jumps into the driver’s seat, his tenor saxophone growling and moaning, injecting jazz into this musical stew. Bob’s healthy sprinkling of jazz is added to the a plentiful supply of funk, augmented by the addition of Latin, rock and psychedelia. The result is a musical feast, which you’ll want several servings of. Non Pacem meanders into being, Moody, spacey and pensive soon changes into a driving groove, where funk, jazz and Latin music combine. Grizzled horns, sweet, but spacey vocals and a funky backdrop. Then Tom Harrell takes charge, laying down a trumpet solo that’s peerless. It blazes, growls and rasps, while stabs of Hammond organ fill in the spaces. The rhythm section and mass of percussion join the sixties-tinged vocal. Later, the arrangement takes on an Afro-Cuba sound, while jazzy horns dance dramatically above the arrangement. You never know what’s about to happen. Curve balls are thrown by Azteca, teasing and toying with you, but always tantalizing and surprising. Expect the unexpected. Ah! Ah! sees a change in style, with the track’s Latin influence shining through. Percussion, flamboyant flourishes of cascading flute and the vocal combine, as the arrangement sashays along. Joining the fun are rasping horns, bursts of pizzicato strings and a pounding bass-line. One minute the arrangement sashays along, the next it’s stop start. One thing remains the same, keeping still is impossible. It’s like a call to dance. Love Not Then sees another change in direction. Like Ain’t No Special Woman, there’s a poppy sound to the track. It flows beautifully along, gradually revealing its laid-back, melodic secrets. Just a chiming guitar, piano and percussion accompany the understated rhythm section. Then tender harmonies float in, giving way to the sweetest and tenderest of vocals from Wendy Haas. The interplay between the harmonies and Wendy’s vocal is exquisite, with lush strings adding to the beauty. Warm, subtle keyboards and rasping horns provide musical contrasts as the arrangement flows beautifully along. Wendy’s vocal and the harmonies are the finishing touch to a track where beauty, emotion, drama and poppy hooks sit comfortably side by side. It’s almost fitting that track called Azteca typifies what Azteca’s music was about. This is a fusion of musical genres and influences. During four minutes of music, Azteca manage to incorporate jazz, Latin, Afro-Cuban and elements of rock and funk. Drama, power and surprises aplenty are in-store. Horns inject a jazzy sound, helping drive the arrangement along. Percussion is ever-present, adding Afro-Cuban and Latin flavors. For their part, the rhythm section add a touch of funk, while a guitar briefly references rock music. All these references rolled into one are a musical description of the music of Azteca. Bookending Azteca is Theme: La Piedra Del Sol, which like the opening track, lasts less than two minutes. The arrangement meanders into being, pensive and spacious. A sprinkling of percussion is joined by a broody bass and braying horns. They’re joined by chiming guitar, timbales and percussion. Repetitive, hypnotic and pensive. Azteca probe, questions and quiz, asking a series of musical questions. Towards the end of the track horns provide an answer to the questions, booking Azteca, Azteca-style. Azteca’s eponymous 1972 debut album Azteca, is a compelling, captivating and enthralling musical melting pot. During the eleven tracks on Azteca, musical genres and influences melt into one. There’s everything from rock, blues, psychedelia, jazz, funk, Salsa, Mambo and Latin, Afro-Cuban music on Azteca. Add to that soulful vocals and gospel-tinged harmonies. When all this is put into Azteca’s musical melting pot and given a good stir, then the result is a delicious musical feast. Curveballs are thrown on regular basis. You learn to expect the unexpected. It’s a musical journey with twists and turns aplenty. Each track is very different from the preceding one. That’s what makes Azteca, such an enthralling and fascinating album. While the words pioneers and innovators are often used to freely, Azteca this is a fitting description of Azteca. Rather than play things safe, Azteca push musical boundaries, producing cutting-edge music. Although Santana produced similar music before Azteca, Azteca took this further. The music on Azteca fuses even more musical genres and influences than Santana did. It’s even more complex and multilayered. Gradually, and with each listen, further subtleties are revealed. Despite being released in 1972, Azteca which will be rereleased by BBR Records on 28th January 2013, has aged well, just like a fine wine. Still, Azteca is a captivating and enthralling musical melting pot, where Azteca fuse musical genres and influences aplenty, seamlessly, and with flair and panache. Standout Tracks: Mamita Linda, Ain’t No Special Woman, Empty Prophet and Love Not Then.